Security, prisoner welfare and successful rehabilitation depend to a large degree on well trained prison staff. However, in many countries, the job is low status, badly paid, and recruits receive little training. Prison staffing is the subject of a special feature in PRI’s new Global Prison Trends report. Rob Allen sets out the main points for consideration below. The core of prison reform is rightly focused on improving the experiences of men, women and children held in detention by advocating better conditions and treatment and the use of alternatives to custody where possible. It’s surprising though how little attention is given to the challenges facing the people who work in prison, given that it is the staff upon whom the day-to-day welfare of prisoners often depends. 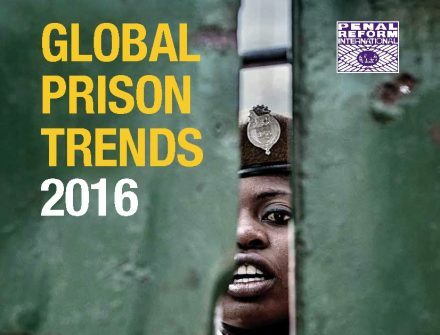 To remedy this, the second edition of Global Prison Trends, launched this week, contains a special feature which seeks to map some of the main challenges facing prison personnel. Recent events in Brussels where striking prison staff reportedly damaged the Justice Ministry during a protest and in London where officers walked out of a jail after a string of assaults on them illustrate the pressures which exist even in high-income countries. In the poorest and in conflict-affected countries, prison staff can find themselves on the front line against insurgency. PRI’s feature reports that 42 prison officers have lost their lives in Nigeria at the hands of Boko Haram. In more stable environments, the threat and reality of harm can be an everyday experience. The US Department of Labor Statistics notes that correctional officers have one of the highest rates of injuries and illnesses of all occupations because of exposure to violence and contagious diseases in the workplace. What is required for safe and effective prisons are adequate numbers of well trained staff who are properly remunerated and valued for the contribution they make to society. While data is not always available or easy to interpret, in many countries there are insufficient numbers of staff to exercise control, with prisoners in effective charge of what happens inside the secure perimeter. Induction training can last no more than a matter of weeks, with an emphasis on security rather than rehabilitation; pay levels can be so low as to offer staff little option but to offer supplementary services to prisoners in return for money. In some countries, staff turnover rates can be high, leading to vacancies, long shifts for those who are working, and the need to transfer staff between prisons at short notice. On the positive side, the feature describes how some countries are developing their prison training schools: the transformation of the prison system in the Dominican Republic has for example been driven by the recruitment and professional training of a new cadre of staff. People working in prisons in the 47 member states of the Council of Europe are expected to respect a Code of Ethics adopted in 2012. The Ugandan Prison service has substantially improved the quality of accommodation provided for its officers and their families. Research has established that prison officers who feel valued, trusted and respected at work are more likely to apply these values to the treatment of prisoners. Hopefully this report can prompt consideration about how that can be achieved and what further advocacy and assistance can be best provided to ensure that it does.